The farmer who is raising duck to earn the egg usually doesn’t sell all of their egg to customers. They do pick the half to re-raising again for replace the older. The cycle of live is really practiced in poultry live both duck and chicken. To raise the duck that just cracked out of the egg is not easy thing to do. The 1-2 weeks old baby duck is risk to dies. All eggs that produce by duck are not as the same quality. Also, we didn’t know how to monitor the egg’s quality because the bad thing is happen inside. Until 3 days after they are cracked out, the baby duck still have the food supply inside their body. After 3 days, the baby duck usually vaccinate to protect them from any disease. Beside vaccinate, you need to give them sugar liquid as additional food to build their energy after 3 days they didn’t eat anything. But still, on 1-2 weeks old is the most critical period because the risk of death is still high. But don’t worry there is the way that you can choose to reduce the risk of death in baby duck which just cracked out of the egg. Remember that this is just effort to reduce the risk, we can’t said that by using this way it would automatically make the baby duck alive. There are so many factors that caused of the death in duck. So be wise to face this thing. Here are some ways to take care for ducks from egg to duck. As mentioned above that the baby duck would have meal after 3 days of cracked out because there is food supplies which still available on their body. Basically after 3 days without eat anything you need to give them liquid sugar to replace their energy. You can mix the sugar with water and give them to baby duck. It is more suggested if you use red sugar. After that, add more energy supply on their water drink. Some brands like Vitachick, Rhodivit, Sorbitol, dll. Make sure that you already prepare the warm cage for baby duck. Like another baby, they are also needs warm to feel safe and comfort. To earn the warm you can use heater that made of bulb lamp. The lamp should be on in day and night. To control the heat, you can use the distance. If the duck makes a group under the lamp actually they feel cold. But if they spread out it means they hot. The heat also matched with the old of baby duck. Make sure that you put same old and type of baby duck in the same cage. Don’t make the cage too small because it can increase their stressed. The top of the cage that used by baby duck should be covering with plastic so the wind of the outside can’t entered. On 3 weeks old, the baby duck can be move in the cage that used with litter. Make sure that the litter is always dry and the plastic above the cage can be removed. Not only the cage but also the baby duck, make sure that both of them are dry. Something wet would invite some diseases that caused by bacteria and fungal to comes. So you better avoid that as well. You must feed the baby duck as common as you can. It is okay with little portion but make sure that it gives every day. Feed your duck by little portion would avoid the food unused. Feed them with 20% food protein. If you want to feed them with wet food would allowed but don’t give them too much. You must to control the freshness too. Giving them vitamin and antibiotic is very suggested because it helps you to raise their appetite. 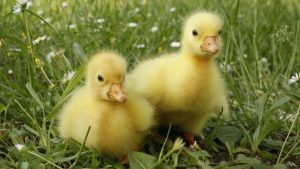 You will get two benefits at the same time, first the baby duck would high appetite and the second they would protected by vitamin and antibiotic that you giving. Air circulating is the one of all factors that you need to watch. The function of circulating is to balancing between CO2 and O2 inside the cage because baby duck under 3 weeks old is really high risk to infected respiration disease. So obviously they need clean air. Here are some diseases like usually attacked the baby duck. You must know about it to prepare the preventive and therapeutic ways as soon as possible. Pasteurellosis Collisepticemia, bumble foot, avian cholera, botullism, and salmone. Avian influenza, fowl pox, and duck virus hepatitis. To increase your knowledge about disease that usually attacked the duck, please kindly check our article about duck disease that you should know. That’s all the ways how to take care for duck from egg to duck. Hopefully this information would help you a lot.